Steff and Nonsense are based in Woodbridge, Suffolk, and are available for birthday parties, fetes, festivals and royal galas! 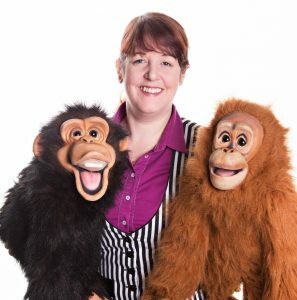 Steff and her cheeky monkeys, Nonsense and Mischief, will enthrall children of all ages with their silly antics and crazy magic. With those naughty monkeys messing things up, Steff struggles to get her magic to work, but luckily the birthday child and their friends can help sort out the mess, making THEM the stars of the show! Kids love the topsy-turvy world, where they can outsmart the grown-up, and with truly amazing magic, pranks and games, this is a show that will keep your children enthralled.